Mariya (Tojolobal, four years old with an IQ of 180 - which disqualifies her for modern politics) has won the catapulting competition. She defeated three young men (out of the six people present). 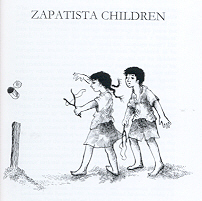 I imagine that because of their age (Húber aged four, Andrés aged three and Andulio aged six) the boys did not feel wounded in their sense of machismo, of which we Zapatistas are so proud. La Mar lifts Mariya onto her shoulders and solemnly declares the victory for feminine power. I am El Sup, so I come out in defence of the men and allege that it was gentlemanliness and not their inferior shooting skill that caused 'my boys' to lose. 'The prize!' La Mar and Mariya shout both together. I haven't got any sweets, so instead I offer: THE STORY OF THE DISSATISFIED TOAD.